The accordion is believed to have been built around 1822 in Berlin. As an instrument, it conjures several types of images in the mind, such as being played by French musician, perched along the river in Paris, or only in folk music. It was used in popular music beginning around 1900 to 1960, but then began to fade with the invention of new instruments like the electric guitar. But there are still many musicians who still feature the instrument in rock and pop music. Although its reputation faded through the 1960s up until somewhat recently, the accordion is now experiencing a late-life resurgence, thanks to indie bands like Arcade Fire and Mumford and Sons, or acts like Weird Al Yankovic, all according to the LA Times. In honour of our upcoming concert Squeezebox on February 10, we set out to find an array of popular songs that feature the accordion. Check out our list below, complete with some honourable mentions. Did we miss a favourite of yours? Be sure to tell us in the comments! In the liner notes to Pete Townshend’s compilation album Scoop, he wrote that he recorded the song for fun one day when he had bought himself an accordion. The accordion gave the song a polka-esque rhythm and the lyrics were “intended as a poorly aimed dirty joke.” Townshend had no thought of it ever becoming a hit; the song is their only international number-one hit, reaching number one in Canada, and reached number two on the Irish singles chart. For their first two albums, British band Mumford and Sons were known for their Americana sound, featuring instruments like the accordion, banjos, and acoustic guitars. The Cave is the third single from their debut album Sigh No More. In this live version, you can both see and hear the accordion, played by band member Ben Lovett, who sings and also plays guitar, drums, percussion, and piano in the band. Often known simply as Sandy, the 1973 song by Bruce Springsteen originally appeared as the second song on his album The Wild, the Innocent & the E Street Shuffle. It was released as a single from the album in Germany. One of the best-known and most praised of his early efforts, the song remains one of his most popular ballads, and has been described as “the perfect musical study of the Jersey Shore boardwalk culture.” Within the E Street Band, the song was heavily identified with musician Danny Federici’s accordion part, which is the main musical element. When I Paint My Masterpiece is a 1971 song written by Bob Dylan. It was first released by The Band, who covered the song on their album Cahoots. Dylan himself recorded the song in the March 1971 sessions that were produced by Leon Russell. Dylan and The Band performed the song together live, in the early hours of January 1, 1972, at a New Year’s Eve concert by The Band; a recording was released as a bonus track on the 2001 CD reissue of The Band’s live album Rock of Ages. The Boy in the Bubble was the third single from Paul Simon’s seventh studio album Graceland (1986). Written by Simon, its lyrics explore starvation and terrorism, juxtaposed with wit and optimism. We were also partial to the video, which begins with a flying accordion. Written by Mick Jagger and Keith Richards, Backstreet Girl first appeared on the UK version of their 1967 album Between the Buttons but was not included on the US version. It was first released in the US on the 1967 album Flowers. The song showcases Brian Jones, playing vibraphone and Rolling Stones contributor Jack Nitzsche on the harpsichord. Accordion was played by Nick de Caro. A much more recent song, Come With Me Now is by South African band Kongos. The song has been described by Billboard magazine as an “accordion-tinged” rock song. Members of the band themselves say that the song is heavily influenced by kwaito music, which is described as being a blend of South African jazz, township pop, and Western house music. What It Takes is a power ballad by Aerosmith, that was written by Steven Tyler, Joe Perry, and Desmond Child. It features an accordion in the chorus, which can also be seen in the music video as a concertina. The song, the second single from Arcade Fire’s debut album Funeral, is (according to lead singer Win Butler) about the Russian space program sending the dog Laika into space. Laika was the first living creature to orbit Earth. Butler said, “It’s a great story about a dog being the first living creature in space. Doing this spectacular thing, but not having food and watching itself fall back into the earth.” In the song, the accordion is played by band member Régine Chassagne. 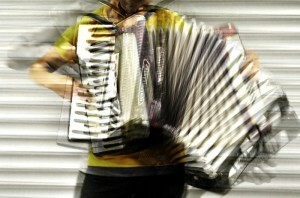 For even more accordion, be sure to join us February 10 for Squeezebox! Tickets start at only $22 – buy now!